To build and improve walking and biking infrastructure, local volunteers and leaders need to educate themselves about different policy tools, planning processes and the like in order to gain support for projects. Here is a brief catalog of resources. A Citizen's Guide to Better Streets: How to Engage Your Transportation Agency provides tips on how to engage effectively with the transportation planning process. It is the product of a joint project between the Project for Public Spaces and the American Association of Retired People (AARP). The first in a three-part series of books on streets and transportation as community-building opportunities, this one focuses on the role of local transportation agencies in street design and outlines effective ways of interacting with transportation agencies. A series of fact sheets from APHA show how public health is impacted by transportation decisions. You can find them by scrolling down to "Transportation", or you can download the PDFs directly by clicking on each link here: Transportation and Public Health; Equity and Health Issues in Transportation; Transportation, Climate Change and Public Health; Transportation Health Impact Assessment; Safe Routes to School and Public Health; Complete Streets and Public Health; and Active Transportation. The Pedestrian Safety Handbook from the American Council of the Blind addresses walking safety for people with visual impairments. This is especially important because people with visual impairments are among the most transportation-challenged members of society, which means that their interest in transportation alternatives align them in many ways with other transportation-challenged populations, such as senior citizens and people with disabilities. Livable Communities: An Evaluation Guide is another AARP publication. It offers preparatory materials for coalition building, conducting community surveys, how-to guides for running meetings and other resources. The guide also covers aging in place issues. Pedestrian and Bicycle Information Center – This national information center site has bike and walking auditing tools, course listings, data, and other information. America Walks – This is an organization that advocates for walking. It offers numerous resources on topics such as street audits, planning, and hosting media events. There are many archived webinars on the site. 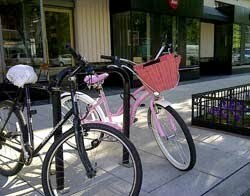 Alliance for Biking and Walking – This organization has resources for advocacy, including how to form and operate a non-profit, and training and educational materials for biking and walking initiatives. The Alliance also invites local groups to become members. The Boulder Bike Story is a 13-minute video that tells a story of leaders and volunteers coming together over the course of 20 years to build a network of bike paths and bike-friendly streets as well as create an entire small city of bikers that has become famous the world over. The Village of Great Neck Plaza Complete Streets Policy Guide does a nice job of explaining what are complete streets, what they can accomplish and their significance to seniors, children, and public transportation. The guide also provides a clear explanation of local versus state versus county roads, which jurisdictions have authority over each, and how a locality can partner with and encourage complete streets design on the roads over which it does not have jurisdiction. This is a resource that communities can copy and edit to adjust to local circumstances and laws. A 2009 report generated by Safe Routes for Seniors, a project of the New York City Department of Transportation, showcases a grassroots effort to conduct pedestrian safety audits of New York streets. It provides some useful measures of pedestrian safety, how older pedestrians perceive safety, along with solutions to improve safety for all road users. Streetfilms has numerous short videos that demonstrate the power of local pictures and regular people talking, walking and biking. They show the effectiveness of the short video format. There is also a 30-minute Streetfilms University training video as well as additional “university” tips on the site. A new brief from Active Living Research details strategies intended to increase bicycling for everyday travel. Strategies include installing on-street bike lanes, off-street bike paths, and other bicycling infrastructure and educational programs. It also outlines policies that can influence the amount of bicycling. Another new resource from Active Living Research discusses strategies to count bicyclists and pedestrians for transportation plans. The resource describes a number of technologies for counting bicycles and pedestrians and the benefits and challenges associated with different approaches. It also explains how counting data can be used to inform transportation planning, presents trends in levels of bicycle and pedestrian activity, and illustrates one goal of non-motorized traffic monitoring, namely, estimating bicycle and pedestrian traffic on streets in cities and towns. PPS's new Rightsizing Streets Guide empowers professionals and community members to make their streets ‘right’ for the context. The centerpiece of the guide is a set of 12 rightsizing case studies that highlight outcomes using before and after data on mobility, crashes, and other parameters. For instance, one lane of Brooklyn's Prospect Park West, which was filled with speeding automobiles, was converted to a two-way cycletrack and today is filled with adults and children on bikes. The outcomes: active transportation has become the norm, bike volumes doubled, bicycling on the sidewalk decreased 93%, and injuries for all modes decreased 21%. Another example is Edgewater Drive in Orlando. The street was transferred from the State to the City’s jurisdiction in order to change the design so that it supported its main street status, rather than a high-speed commuter corridor. After the road diet, walking increased 23% and bicycling 30%. The Federal Highway Administration has updated its Pedestrian Safer Journey program for teaching pedestrian safety to children and teens. Pedestrian Safer Journey helps educators, parents and others who care about pedestrian safety to get the conversation started with children and youth. Three videos — one for each of three age groups: 5-9, 10-14 and 15-18 — accompanied by a quiz or discussion and an educator’s resource library can be used as an introduction to pedestrian safety skills or to augment a curriculum. The videos, which are available in English and Spanish, address picking the safest places to walk and cross streets and the importance of being alert. An App That Tells You How Walkable a Street Really Is: this Atlantic Cities article explains a new cell phone app, Walkonomics, which supplies information about pleasant, possibly longer, alternative routes, condition of sidewalks and intersections, and crime rates in the area. The app is only available for Manhattan, San Francisco, London and other major English cities (the designer is English), with expansion soon to additional cities in the U.S. There are still some kinks, the article notes. It is built using public data sets that generate star ratings. The eight factors that go into the ratings are "road safety; ease of crossing the street; quality of sidewalks; hilliness; ease of navigation; fear of crime; what [the developer] refers to as how 'smart and beautiful' a street is, in other words its aesthetic quality; and whether the street is 'fun and relaxing.'" The Arizona State University and Research Triangle International (RTI) Spatial Impact Factor database has been online since 2009 and offers downloadable Microsoft ACCESS files that present an abundance of health-related data. During last legislative session, the Massachusetts Legislature considered a bill that would lower the default speed limit on local roads from 30 to 25 mph. The bill would apply only to "functionally classified local roads," as designated by the Massachusetts Department of Transportation (MassDOT). It excludes main arteries and the streets that feed them. The Metropolitan Area Planning Council (MAPC), in partnership with Massachusetts Department of Health (DPH), conducted a Health Impact Assessment (HIA) to examine potential health impacts of the proposed bill. Based on a literature review, case studies, and statistical models, the HIA predicts that the bill would have a positive public health impact, particularly by preventing traffic fatalities and injuries. Potential co-benefits include enhanced walking and biking environments that may encourage physical activity, as well as increased desirability of properties on local roads due to quieter and safer streets. The first national Walking Summit takes place in Washington, DC, Oct. 1-3. If you think walking can make us healthier and our communities more vibrant, or you want to participate in the first America Walks "Hill and Agency Day," or you just want to connect & learn with the foremost leaders in the walking movement, then mark your calendar. Visit www.walkingsummit.org. The 11th annual Active Living Research Annual Conference will be held Mar. 9-12 in San Diego, CA. The call for abstracts is open. Visit http://www.activelivingresearch.org/conference2014. Aug. 20-21 - Roadway Safety Culture Summit: Washington, D.C.
Sept. 9-12 - Association of Pedestrian and Bicycle Professionals: Professional Development Seminar (PDS): Boulder, Colo.
Sept. 18-21 - Teen Distracted Driving Prevention Summit: Washington, D.C.
Sept. 24-25 - National Health Impact Assessment Meeting: Washington, D.C.
Oct. 1-3 - 2013 Walking Summit: Washington, D.C.